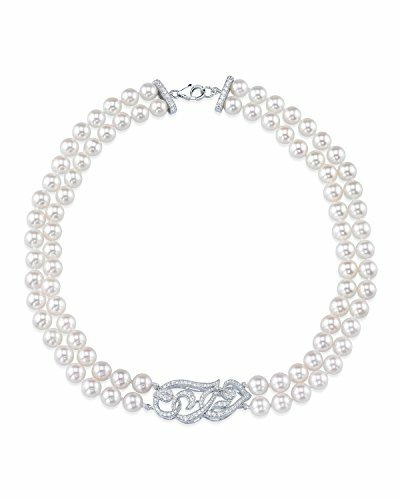 This chic necklace features AAA Quality, 7-8mm white Freshwater cultured pearls. The pearls are strung and double knotted on the finest silk thread with a dazzling cubic zirconia studded sterling silver accent piece. The necklace is nested to a 17-18 inch length. Our necklaces are packaged in a beautiful jewelry box, perfect for gifting. This necklace features the finest quality .925 sterling silver and dazzling cubic zirconia. Our necklaces are packaged in beautiful jewelry boxes, perfect for gifting. In addition, all products are accompanied by a genuine cultured pearl guarantee, verifying the quality and source of the pearls.